Erosion at Perlican’s Reach was the impetus of the 2017 project. Widening the full length of the beach in Southern Shores would cost between $9 million and $13.5 million if it is done at the same time that neighboring towns renourish their shorelines in 2022, a recently completed assessment says. The Vulnerability Assessment and Beach Management Plan by Aptim Coastal Planning and Engineering of North Carolina looked at scenarios based on a storm similar to 2003’s Hurricane Isabel, which was so powerful it carved a new inlet through southern Hatteras Island. Also taken into account were long-time erosion rates, the impact of storms, tide cycles and past, present and future sea-level rise. “The Beach Management Plan provides a long-term vision for the Town of Southern Shores to sustain the beaches that support a significant portion of their local economy and maintains the tax base of the Town,” a summary of the plan said. Taking into account varying heights and widths of the primary dunes, the management plan looked at 3.7 miles of shoreline. The most expensive option looked at what it would take to protect the shoreline if a storm similar to Isabel hit at the estimated sea-levels in 2048. The other two applied the data to 2018 levels. Southern Shores will need to start planning soon. 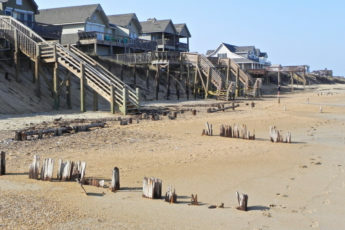 The study recommended an updated beach profile survey this spring, the same time as Duck, Kitty Hawk and Kill Devil Hills, so that all would be working from similar data. The town piggy backed on the north end of Kitty Hawk’s project in 2017 to pump sand onto 1,500 feet of severely eroded beach. My beach is getting more and more narrow. No one has mentioned problems at the north end of Ocean Blvd., near Hickory Trail. When I put in sand fences, they didn’t put them at the edge of the vegetation on the beach. Now the vegetation has receded to the fence line and high tide gets nearer and nearer to my house at 8 Purple Martin Lane. Charlie and Donny, just because you want crowded, pounding obx-ious beaches, that doesn’t mean that Southern Shores is all about the summer money. We are a quiet family town in a lot of ways and just don’t need that mess. Our beaches are very healthy, there are great sand bars, and there is no need to waste 10 million on a stable shoreline and sparse visitors. Best of luck! As a resident, I hope the town looks at sustainable ways of doing this, and also addresses building codes that work with “Mother Nature”. I know a lot of people that are hoping this project can be implemented for Southern Shores. The beach nourishment sure has helped in other areas. Good luck, SS!